The announcement by President Xi Jinping of the “Asia-Pacific Dream” at the start of the APEC summit in Beijing has been seen by many as China’s latest attempt to respond to the Obama administration’s “pivot.” Unlike the “Pacific Dream” used by Secretary of State John Kerry to describe Washington’s rebalancing, Xi puts China at the center, using its growing power to promote “new initiatives and visions for enhancing regional cooperation” in the context of a “community of shared destiny” held together by “silk roads” fanning out on land and sea to all parts of the globe. Xi’s announcement is also significant because it came just before he shook hands with Prime Minister Abe Shinzo, the first sign of a possible thaw in their relationship since the two leaders came to power. Abe has his own version of pivoting, inspired by his vision of Japan as the “Beautiful Country.” This is already reorienting Tokyo’s foreign policy aimed at bringing “more balance” to the relationship with the United States in order to have greater latitude in taking a leading role in the region through “Proactively Contributing to Peace,” enhancing “Open and Stable Seas,” and aligning with states that share the same material interests and ideals of liberalism and democracy. Pursuing these pivots means moving away from the policy frameworks that the leaders of China and Japan inherited when they came to power in 2012. For Xi, the cautious policy of “peaceful development” in a “harmonious world” that had come to characterize Chinese foreign policy after entry to the WTO in 2001 was already giving way to growing assertiveness over China’s maritime territorial disputes. This was largely due to rising public expectations for a more assertive foreign policy after the triumphant spectacle of the Beijing Summer Olympics and the perception of the decline of the United States and Europe with the deepening of the global financial crisis. On coming to power, Xi continued the escalation of regional tensions through bolder and more coordinated actions, called on the armed forces to prepare for combat, and stepped up efforts to shape the regional trade and financial system, most recently with the establishment of the Asian Infrastructure Investment Bank at the APEC summit. 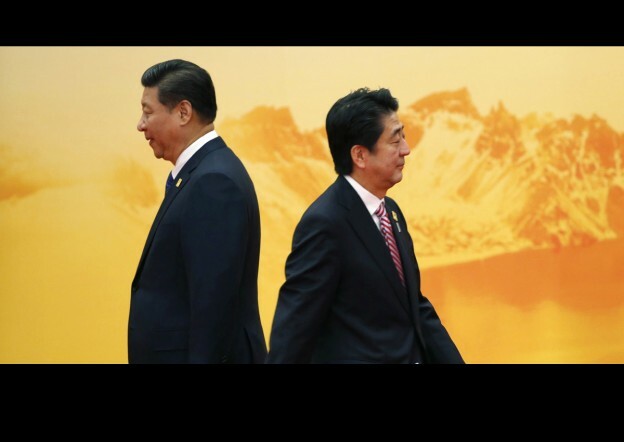 Abe had to make a sharper break with the foreign policy of his predecessor. The series of DPJ administrations that he replaced had downplayed the alliance with the United States and moved towards working with China to build an Asian Community, disdaining what was seen as a form of globalization driven by American-style, free-market economics. Despite the fact that many commentators blame the crisis in Sino-Japanese relations on Abe, it was China’s increasing maritime assertiveness since 2010 that did most to raise tensions. This allowed Abe to cast aside the assumption that regional integration leads to international stability that had underpinned Tokyo’s decades-old policy of engagement with China. In its place, he designed a defense strategy that takes into account the fact that interdependence can increase risks. China’s rise is thus seen as posing a threat that can best be countered by casting off the constitutional provisions and public attitudes that have put constraints on the use of force and engaging in collective security since Japan’s defeat in 1945. To take their pivots forward, both leaders have had to branch out beyond the geographical scope of existing alignments. Abe’s policy thus talks about rebalancing the longstanding LDP attachment to the US alliance by looking westwards to the ROK and India and southwards to Australia. One way to do this while maintaining a strong relationship with the United States is to use trilateral alignments as bridges towards the creation of a regional architecture. This has the advantage of making it easier for third-party states to work with Japan, even when there are sensitive problems in bilateral relations, as with the ROK, where there is widespread antipathy towards Abe’s revisionist views on history. President Park has to prove her patriotic credentials in light of revelations that her father, the military dictator Park Chung-hee, served in the Japanese imperial army in Manchukuo. India is another interesting case, seen as a democratic bedfellow that has its own concerns over China, but also as a state that has a special relationship with Japan harking back to the pre-WWII era, when the people of the two countries supposedly stood together against Western imperialism, as Abe recalled when, as prime minister in 2007, he visited the family of Judge Pal, the sole dissenting judge at the Tokyo Tribunals. Xi Jinping has to broaden out from strengthening China’s relationship with Russia and the Central Asian states that came together to form the SCO, bound together by a shared aversion to any kind of international intervention or activity that might lead to domestic political change. He was fortunate in this respect because in May 2014, China took the chair of the Conference on Interaction and Confidence Building Measures in Asia (CICA), a multilateral organization that had gone largely unnoticed since it was established by Kazakhstan in 1992, but boasts a membership that spreads from Russia and Central Asia to the Middle East, as well as including Vietnam, Cambodia, Thailand, and the ROK. To expand outwards from this core group of like-minded states and into the Pacific, Xi also has the option of trying to use China’s economic influence. This was seen with the signing of a China-Australia FTA when he visited Canberra after the G20 Summit. Chinese observers see this as having a positive impact in the security realm. Wang Wen, for example, interprets the new agreement as a dilution of what he claims is US-European hysteria over China’s rise. Wu Xinbo presents it as a way to counter Obama’s pivot and weaken the trilateral alignment among Australia, Japan, and the United States. Given the strengthening of US-Australian military ties under the Abbott administration and the different value systems underpinning the political systems in Australia and China, it is unlikely that such trade liberalization will make much difference for the security situation in the Asia-Pacific. This leaves the hedging states of Southeast Asia as the arena where the pivots of the two leaders meet head on. Unfortunately for Xi, much of the diplomatic capital that had been accumulated by China in this sub-region had been squandered by the increasing assertiveness in the last years of the Hu Jintao era. A Pew public opinion poll in 2014 found that a majority of citizens in every East Asian country are either very or somewhat concerned that territorial disputes between China and neighboring states will lead to military conflict. In Japan and Vietnam the figure is 85 percent and in the Philippines an astonishing 93 percent. Even Thailand—a country that has no territorial disputes with China—scores 50 percent. The scene was thus set for Abe to try to turn the tables on China in Southeast Asia, claiming that Japan is now the state that is most dedicated to the maintenance of state sovereignty, independence, and the defense of territorial integrity. While China has the advantage of being a vital trade partner throughout the sub-region, Japan also has a significant economic footprint that can be used to promote Abe’s strategy. It is still a major export market and its FDI is much larger and better suited to industrial upgrading than China’s. The quantitative easing central to “Abenomics” added to the supply of money, an increasing amount of which is being diverted from China, where the costs of land and labor are making production more competitive and Japanese firms have to factor in growing political risk. It is to these growing dynamics that Abe could look for extra diplomatic traction when he made his first overseas visits after returning as prime minister to the capitals of the sub-region. So long as Xi is unable to compromise on China’s claims in the South China Sea, he has to respond to Japan’s pivot by coordinating the use of economic, military, and diplomatic power in ways that minimize unnecessary diplomatic fallout in Southeast Asia. Chinese observers thus note that there has been a movement away from the experimental “incubation period” of policy that started in 2010, when Beijing raised tensions by hinting that that the South China Sea was an area that lay within its new doctrine of non-negotiable “core interests.” Much has been learned from the lack of coordination that followed, described as “nine dragons stirring up the sea.” This was when strategy veered from provocative acts, such as the cutting of the cables of a Vietnamese survey ship in May 2011, to diplomatic attempts to calm fears and avert greater US involvement, as in signing a joint statement with Hanoi on principles for resolving maritime disputes just two months later. This learning experience is said to have been further enriched by the crisis with the Philippines over Scarborough Shoal between April and June 2012, just before Xi was appointed General Secretary of the CCP. China’s response to this standoff has been christened the “Scarborough Shoal Model” (Huangyan dao moshi), a term that first appeared in a Party organ when it was used by the overseas edition of the People’s Daily in May 2012. It has been lauded by Chinese commentators for using just enough force to contain the conflict on China’s terms, resorting to Oceanic Bureau and coast guard vessels to exert pressure on the enemy, while the PLA Navy was confined to posing a credible threat on the horizon. The Ministry of Foreign Affairs also played a part, countering Manila’s diplomatic campaign by presenting China’s actions as a defense of the status quo and the rule of law, backed up by copious amounts of historical evidence. Even the Ministry of Agriculture got involved by announcing a fishing moratorium over most of the South China Sea. Most interesting was the use of China’s economic power, through the suspension of tourism to the Philippines and the impounding of banana imports. As Xi assumed the presidency in March 2013, the State Council further consolidated this coordination between the various agencies into a “clenched fist” (zuhe quan) of different policy instruments under the Oceanic Bureau. When this was followed by the establishment of China’s first State Security Council in November, hopes rose for more effective control in the management of maritime territorial disputes, allowing claims to be pursued while avoiding the escalation of military and diplomatic conflicts. Yet greater coordination should not be confused with more moderation or willingness to compromise. Even Chinese commentators who advocate caution accept that the government has to respond to growing pressure to protect China’s growing overseas interests and sea lanes of communication (SLOCs). They explicitly state that the CCP cannot appear to be weak over territorial claims if it is to ward off domestic attacks on its nationalist claim to legitimacy. Addressing this dilemma between constraint and credibility is made more difficult when other states appear to be taking advantage of Chinese self-restraint, as when Vietnam expanded its claims to maritime territory, hosted the US nuclear aircraft carrier Independence, and announced cooperation on oil exploration with India in two areas under Chinese administration. As if to ensure that the establishment of the State Security Council did not send out the wrong message, it was quickly followed by the provocative act of declaring a Chinese Air Defense Identification Zone (ADIZ) covering the Senkaku Islands and waters claimed by Japan in the East China Sea. The shift of Xi’s strategy into an “active” stage was evident also in the establishment of the Sansha Municipality to administer an extensive but unspecified area of the South China Sea, the launching of China’s first aircraft carrier, the Liaoning, and announcements that the China National Offshore Oil Corporation (CNOOC) will conduct exploration and development around the Spratly Islands. Most provocative of all was the dispatch of an oil rig by CNOOC to waters off the Paracel Islands and the declaration of an exclusion zone in waters claimed by Vietnam, where China explored for gas and oil between May and July 2014. When this led to violent clashes between vessels from the two sides, the sinking of a Vietnamese boat, and the eruption of violent anti-Chinese demonstrations inside Vietnam, some commentators in China began to warn that the strategy was becoming unbalanced, with the growing ability to win the South China Sea increasing the risk that ASEAN might be lost in the process. In October 2013, Xi thus tried to calm nerves in the sub-region by delivering his speech on “peripheral diplomacy” to the Indonesian parliament, harking back in some respects to the era of “good neighborliness” under Hu Jintao. It is in this context that he began to emphasize the importance of the themes of including Southeast Asia in the New Maritime Silk Road and of forging a “community of shared destiny” with China that were used to give content to the “Asia-Pacific Dream” in his APEC speech this year. Although such themes are intended to be reassuring, their implications for the formation of a regional community remain far from clear. The term “community of shared destiny,” used first by Xi at the Boao Forum in April 2013, is particularly intriguing. Repeated in speeches throughout the year, including his speech in Jakarta, his speech to the CICA conference, and a key speech to the conference on diplomatic work in October, it, perhaps most significantly, was also used in his speech to the first meeting of the State Security Council in April 2014. Yet, it first became prominent in Chinese political parlance in the 1990s, when it was used by Lee Teng-hui, president of the Republic of China, to describe Taiwan as an independent political entity. Lee took it from Peng Ming-min, the intellectual father of the pro-independence movement in Taiwan in the 1960s, who had taken it from Ernst Renan’s theory of the nation. Given the scorn poured on the concept by Chinese commentators at that time, it is odd that Xi is now using a theory of the nation to define the Asia-Pacific region. Even if he thinks of the region along the lines of a nation, he is giving no sense of how Chinese power might operate in such a model. What makes this emerging vision even more problematic are signs that the “Asia-Pacific Dream” is an extension to the international realm of Xi’s aspiration to create the “China Dream” in domestic politics. This vision appears to have been influenced by The China Dream, a monograph published by Colonel Liu Mingfu of the PLA just after the global financial crisis, which argues that China is now powerful enough to move on from Deng Xiaoping’s cautious doctrine of “biding time and building capabilities” to establish a new “Yellow Era” under its own global leadership. This is a hierarchical conception of an international order that is maintained by the leading power’s righteous values (wang dao), rather than the use of force (ba dao) that is said to have been used to regulate the Westphalian system that spread to Asia from Europe and the United States. While this use of tradition has been described as “neo-Confucian,” it is also compatible with the growing conflation of popular nationalism with geo-strategy, which are merging in a “geopolitik” mode of thought in which China is said to have been at its historically weakest when it relied primarily on cultural influence and at its strongest when it backed soft power with hard power. Concepts such as “Maritime Silk Road” and “community of shared destiny” are not just a matter of abstract ideals. Xue Li explains the policy implications of the Maritime Silk Road as emerging through three stages that a rising power has to go through to manage its peripheral relations: stabilization of the periphery, transitional strategy and “shaping” (su zao). China is said to be moving from the first into the second by expanding the scope of United Front work to increase the dependency of the ASEAN states. By paving the way with investments in infrastructure and security cooperation in areas such as piracy, conservation, and safety of navigation, it is hoped that a “community of shared destiny” can be built in a way that encourages identification with China through appeals to notions of kinship, sincerity, wisdom, and tolerance. This all sounds benign until the proviso is added that there can be no concessions on China’s territorial claims. Even projects designed to combine economic development with environmental conservation, such as the establishment of a Hainan Ocean Park and the opening of the Paracels to tourism in April 2013, are presented as ways to declare Chinese sovereignty. The need to make it clear to the wider world that China’s constructive diplomatic overtures towards its neighbors do not imply that it will make any concessions on its territorial claims could explain apparently irrational foreign policy behavior, such as the incursion of PLA forces across the Line of Actual Control marking the border with India just before Xi visited that country to meet Prime Minister Narendra Modi in September 2014. If this strategy continues, it is likely that the “Asia-Pacific Dream” will be conditioned at some point by another assertive measure to prevent the misperception arising that China might be taking a weaker position over the pursuit of its “core interests,” such as the declaration of an ADIZ in the South China Sea. It is hard to see how any leader in China can find a way out of this situation when faced by rising nationalism. Yet, the CCP has been actively attempting to bolster its legitimacy by raising the prospect of an imminent attack by foreign forces since WTO entry in 2001 and reminding the population of the national territories that have yet to be recovered. Central to this has been the reinforcement of National Defense Education and National Defense Mobilization, which involves teaching military skills and discipline in schools and work units and the use of textbooks in which the nine-dash line is presented as national territory to be reclaimed. This line also appears on maps used for public events, such as the Shanghai Expo in 2009, and on a page in the latest version of the Chinese passport. Abe’s room to pivot is also shaped, to some degree, by a complex linkage between domestic political discourse and foreign policy. Many of the themes of the “Beautiful Country” go back as far as 1997, when he began to campaign for a departure from the postwar constitutional settlement as a founding member of the Young Diet Members Committee to Consider the Future of Japan and History Education. The theme was more fully articulated a decade later during his campaign to rise to the top of the LDP and secure his first term as prime minister. As a political strategy, it makes sense in the context of the struggles amongst the “Heisei” generation of politicians, born after WWII. Unlike the “neo-revisionism” of older right-wing traditionalists, Abe’s nationalism is used to discredit the postwar democracy promoted by political rivals on the progressive wing of Japanese politics, such as the Yoshida School and the conservative tendencies established by the Keisei-kai politicians, Sato Eisaku and Tanaka Kakuei. It thus rejects anti-militarism as a risk to the security and international status of the Japanese nation and sees the promotion of “democracy” as a way to reform the Constitution to legalize broader military cooperation with the United States and its allies and to encourage the restoration of patriotism. These links between domestic politics and foreign policy in both countries create the prospect of a downward spiral of competitive nationalism. Although there are many differences, they share an antipathy to individualism and cosmopolitanism and both condemn progressive liberals as traitors. Education is also taken by them to be one of the keys to building a strong nation that is willing and able to use military power. In China this is compulsory, implemented under the 2001 National Defense Education Law and the 2010 National Defense Mobilization Law; in Japan, Abe decries the Basic Education Law that was created during the Occupation for depriving the young of their national pride and neglecting the essential Japanese values of self-discipline, public mindedness, and affection for community and national traditions. Both leaders are introducing new types of moral education to strengthen patriotism and respect for the military. This militarization can also be seen in broader cultural projects in both countries. In China it was evident in the choreography of the Beijing Olympics, but also takes place at the grass roots level from militia training to popular television soap operas about the war against Japan. This process is just starting in Japan, where the Ministry of Defense is calling for “the enhancement and strengthening of social infrastructure” through more interaction between the Self Defense Forces (SDF) and local communities and citizens. Regional Defense Bureaus are charged with the job of holding seminars and briefing local residents, the ministry distributes on-line videos and commercial films, and the various branches of the SDF engage in a certain amount of military theater, including annual live fire displays by the SDF, events where the public can become familiar with military equipment, and military band concerts that sometimes involve parades through cities. Even the performance of military personnel at the major sporting events, such as the Olympic Games in London and Sochi, is used to promote the prowess of the armed forces. There is also a plan for greater involvement of the military on campuses to “enhance the intellectual base” of security by promoting “education on security-related matters at educational institutions”. Although Abe’s project to restore the patriotic spirit and respect for the armed forces fuels concerns that he is engineering a revival of militarism, so far his policies are only a pale reflection of China’s. Media products sponsored by the Ministry of Defense, such as the film Library Wars and the TV drama Public Affairs Office in the Sky, tend to present the military as uniformed bureaucrats involved in personal intrigues and romances, not the macho heroism of the warriors in Chinese productions. In Japan, moreover, popular and parliamentary opposition forced Abe to abandon attempts to lift the constitutional ban on collective defense, driving him to resort to the controversial measure of using a reinterpretation of Article 9. Moreover, the election of Onaga Takeshi as governor of Okinawa in November on a clear policy of opposition to the relocation of the US Futenma airbase to a remote site off the north coast of the island shows that attempts to improve the relationship between bases and their surrounding communities still have a long way to go. With China undertaking its most provocative acts in the South China Sea, rather than waters claimed by Japan, public attention has focused more on the domestic politics of corruption in the cabinet and the impact of another hike in the consumption tax than on foreign policy. Xi appears to be far more likely to be hoisted on his own petard of nationalistic militarism because his leadership depends to a large degree on the close relationship he has forged with elements of the PLA throughout his rise to power. Although there is growing consensus among China watchers that Xi is consolidating his position, he is unlikely to be able to make concessions on territorial claims in the midst of a major purge of corruption in the Party and the military. The most outspoken and articulate critics of corruption in the military, moreover, are foreign policy hawks like Colonel Liu Mingfu and General Liu Yuan. These are the people that Xi needs to keep on his side if he is to succeed. There has even been speculation that General Liu is about to be promoted to the highest military organ, the Central Military Commission. It is thus proving difficult for both leaders to make the different aspects of pivoting hang together. For Xi, it is becoming clearer that the use of the hard and economic instruments of foreign policy to put pressure on the states with which China has the most serious territorial disputes can lead to unintended consequences. It has been astonishing to see how China’s response to the perceived decline of American power has led its government to throw away much of the diplomatic credibility that was accrued in Southeast Asia by the establishment of the China-ASEAN FTA. Given the importance that has been attached to winning the support of the Chinese diaspora under Reform and Opening, Chinese commentators were particularly shocked to see that the Federation of Filipino Chinese Chambers of Commerce took a prominent role in the anti-Chinese demonstrations organized in response to the Scarborough Shoal incident. The unintended consequences that arise from the increasing complexity of Xi’s pivot can be seen at the level of elite politics, especially in the case of Vietnam. Despite regular meetings between leaders of the Chinese and Vietnamese communist parties, the anti-Chinese riots in the spring of 2014 heightened speculation of a split in Hanoi on whether or not to push back hard against China and align more closely with the United States. One of the most unwelcome consequences for the CCP would be if popular nationalists were able to exploit such divisions to create space for political liberalization. It is possible to find evidence of concern among Chinese industrial groups over the consequences for their operations of deteriorating relations with neighboring states, especially if they are denied the opportunity to take advantage of using them as manufacturing bases to export tariff-free to the EU and US markets under the TPP or the FTA about to be signed between Vietnam and the European Union. The biggest complexity, though, is that pivoting is becoming increasingly three-way as Japan enters the reshaping of the region caused by the shift of power from the United States. With Washington now describing its pivot as a “rebalancing” that does not imply substantial new commitments to the region, Vietnam and the Philippines are turning increasingly to Japan as a way to counter their growing dependence and military vulnerability in the face of China’s rise. Along with investment, Tokyo is eager to increase military-to-military exchanges and supply advanced coast guard vessels. When India is brought into the picture, the options of the Southeast Asian states on the front line facing China’s assertiveness do not appear so limited. Even while Xi Jinxing was visiting India’s prime minister, most of the world’s media did not pick up on the fact that its president was in Hanoi discussing an increase in arms exports and more cooperation on maritime security. Yet, making the various elements of Japan’s pivot hang together will not be easy either. Much will depend on the success of Abenomics, which received a serious body blow when the economy slipped back into recession. In the longer-term, Japan also has to face the serious problem of a greying population, with 25 percent of its citizens already over the age of 65. Ultimately Japan also has to locate itself in the broader dynamics of regionalization shaped by the push and pull of China and the United States in the global economy. Shortly after Xi Jinping waxed eloquently about the prospects of an “Asia-Pacific Dream” at the opening of the APEC summit, the reality of Chinese power was brought to the world when he used his closing speech to announce the launching of a feasibility study for a FTA of the Asia Pacific that would bring together 21 Pacific-Rim states, from which the United States was absent. This was a smart way to overshadow Washington’s TPP strategy, which Obama had just been discussing with eleven other heads of state at the US Embassy in Beijing— in the absence of Xi. If pivots create challenges and opportunities for all the big three players, much the same can be said for the smaller states of the region, especially those in Southeast Asia, which might continue to accrue the benefits that come from hedging if they play their cards right. When the dangers inherent in competitive nationalism and the uncertain future of the power and intentions of the United States are added to the mix, however, the balancing acts involved in multi-pivoting will be hard for all sides to maintain. Whatever Xi’s intentions for the Asia-Pacific Dream, the risk of conflict from misperceptions and the complexity of strategic calculations continues to rise. 1. Japanese Ministry of Defense, Heisei 26 nendo iko ni kakaru boei keikaku no taiko nitsuite, http://www.mod.go.jp/j/approach/agenda/guideline/2014/pdf/20131217_e2.pdf. 2. Wang Wen, “Zhongau FTA jiang xishi Oumei guojia dui Zhongguo jueqi de konghuang,” Huanqiu wang, November 17, 2014, http://world.huanqiu.com/exclusive/2014-11/5205453.html. 3. Xinbo Wu, “Zhongguo buyong Audaliya ‘xuan bian zhan,’” Huanqiu wang, November 13, 2014, http://opinion.huanqiu.com/opinion_world/2014-11/5200477.html. 4. Pew Research Centre, “America’s Global Image Remains More Positive than China’s,”, http://www.pewglobal.org/files/2013/07/Pew-Research-Global-Attitudes-Project-Balance-of-Power-Report-FINAL-July-18-2013.pdf. 5. Qin Hong, “Miandui Feiliubin, women zugou shoduan,” People’s Daily (overseas edition), May 8, 2012. 6. Zhang Jie, “Huangyan dao moshi yu Zhongguo haiying weiquan zhengce de zhuanxiang,” Dongnanya yanjiu, no. 4, 2013: 26-31. 7. “Xi Jinping waijiao xin zhanlue: ‘mingyun gongtongti’ tuidong guoji geju xin zhixu,” Renmin wang, July 23, 2014. 8. Christopher R. Hughes, Taiwan and Chinese Nationalism: National Identity and Status in International Society (London and New York: Routledge, 1997), 37. 9. Liu Mingfu, Zhongguo meng: hou Meiguo shidai de daguo siwei yu zhanlue dingwei, (Beijing: Zhongguo youyi chubanshe, 2010). 10. Christopher R. Hughes, “Reclassifying Chinese Nationalism: The Geopolitik Turn,” Journal of Contemporary China, no. 20 (2011). 11. Xue Li, “Jianshe ‘Haishang sichou zhi lu’: jiejue Nanhai zhengduan de cuihuaji,” Shijie zhishi, no. 10, 2014: 23-25. 12. Deng Yingying, “Yi haiyang gongyuan wei hezuo moshi cujin Nanhai luyou hezuo,” Nanhai Daxue xuebao renwen shehui kexue xuebao 32, no. 3 ( 2014): 33-49. 13. Maiko Kuroki, Nationalism in Japan’s Contemporary Foreign Policy: A Consideration of the Cases of China, North Korea, and India (London School of Economics, PhD dissertation, 2013). 14. Ministry of Defense, Japan, Defense of Japan 2013 (Tokyo: Erklaren Ltd., 2013), 299. 15. Liang Long, “Yuenan: liyi yu fengxian de boyi,” Zhongguo fangzhi, no. 6 (2014): 62-63.